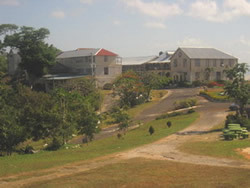 Hampton School, like Munro College, has its origins in the Munro and Dickenson Trust. Robert Hugh Munro in his will dated January 21, 1797, bequeathed a part of his estate to his nephew Caleb Dickenson and the Churchwardens of St. Elizabeth to set up a school in the parish for the education of as many poor children as the funds was able to provide for and maintain. Dickenson improved the property of Munro, so that when Dickenson died in 1821, he was far wealthier than his uncle had been. In his will, Dickenson desired that his Trustees carry out the wishes of his uncle to educate the poor. For several years nothing was done about carrying out the wishes of Dickenson. It was not until 1855 that a fraction of the original bequest was rescued and Act 18 Victoria Chapter 53 was passed. By this Act, the Custodes and Rectors of St. Elizabeth and Manchester, the Members of Assembly for St. Elizabeth and five others became "The Governors and Trustees of Munro and Dickenson Free School and Charity". In 1856, the Trustees opened a Free School for boys, which later became known as Munro College. In 1858, a school for girls was started at Potsdam, on the same property as the Boys' School. This location was found unsatisfactory and the Girls' School was then for a short time at Torrington, then was moved to Mount Zion, now called Stirling. By December 1884, there were fewer than 12 girls at the school and Miss Elizabeth Ramson, first headmistress of the school, had resigned. In 1885, with a new headmistress, Miss McCutcheon, the school reopened at a new location, Malvern House. By 1891, Malvern House was given up and Hampton, formerly known as Fort Rose, was rented from Mrs. Boxer. When Mrs. Boxer died, the Trustees purchased Hampton for ₤800 in 1896. The Girls' School eventually became known as Hampton. In 1890, the Trustees introduced a system of Lady Principal and Headmistress. Mrs. Julia Comrie was then appointed as the Principal and Miss Geddes as Headmistress. This system however, was not satisfactory and in 1893, the Trustees reverted to the original system. Miss Holden was appointed in 1894 as the new Headmistress, bringing Miss Gertrude Boyd with her as an assistant. Miss Holden was the first Headmistress who saw the school as more than a Charity School for a handful of girls. She introduced drawing, painting and music and made the school a place for girls to get a good education. When she resigned in 1904, the school had more than 60 girls and 22 candidates were entered for the Cambridge Examinations. Miss Barrows replaced Miss Holden as Headmistress. During her time there were extensive additions to the buildings including music rooms and a building to contain a hall, common room, library and dormitory. Miss Barrows was Headmistress for eighteen years. When she resigned in 1922, the Trustees offered the post to Miss Campbell who had been second Mistress, 1908 to 1910. During Miss Campbell's 11 years as Headmistress, the school continued to be one of the leading Girls' Schools in the West Indies. The Trustees paid a great tribute to Miss Campbell on her resignation and made particular mention of the Chapel, which was erected almost entirely through her devoted efforts. Today Hampton School continues to be committed to producing young ladies who are optimally rounded. Approximately 950 students are on roll and about one-third of the student population are boarders. This building was erected under the supervision of Mr. Henry Maxwell, one of the Trustees, and took three and a half years to build. It was opened on October 8, 1913 by His Excellency the Governor, Sir William Henry Manning and received its name Calder Hall, from Mr. John Vassal Calder who was chairman of the Trust for over 30 years. This imposing structure has a cut stone base and a timber upper floor. The lower level features a buttressed arcade, above which is a balcony which has timber posts and timber handrails. The gable roof on the structure is inclusive of dormer windows. Pivot windows are featured throughout. The building contained a hall and a common room on the ground floor and a dormitory and bedrooms for mistresses on the upper floor. Today, the ground floor continues to be utilized as a hall and common room, but the upper floor has been converted to a staff room and dubbed "Parnussus". During the tenure of Ms. Campbell, buildings tended to named after Greek methodology. Originally the great house of the Hampton property, this building dates from the nineteenth century. This two storey structure has a timber upper floor and nog on the lower level. Timber columns and timber handrails are prominent features of the verandah. The building, which has sash windows throughout, is crowned with a hip roof. This building was erected during the time of Miss Maud Barrows and was later named the Wesley Gammon building in honour of one of the past principals for the period 1955 to 1982. This structure features a cut stone base and a timber upper floor. The main building is covered with a hip roof and a shed type roof covers the timber balcony. The Chapel is primarily a stone structure covered with a gable roof. The roof is partially supported by one-foot posts at the sides of the building. Semi-circular stone steps lead to the entrance. An outstanding feature of the Chapel is the east window which Frank Cundall stated as being "the finest stained glass window in Jamaica". It was designed by James Balantyne of Edinburgh, to express the Chapel's dedication to St. Mary and All Souls. Ernest Newton undertook to make plans for the Chapel at a small fee. The builder of the Scottish War Memorial, Mr. McLeod, found that he had a piece of granite left over from the Usher Hall in Edinburgh. This piece of granite Mr. McLeod donated for the Hampton Chapel foundation stone. Limestone was quarried for the building of the structure when a limestone ridge was blown up to construct a hockey court. The Chapel was built during the tenure of Miss Campbell, principal from 1922 to 1932. Val Halla, which is the School's music room, was built during the time of Miss Maud Barrows, principal from 1904 to 1922. This cut stone structure has a concrete addition to left side of the front elevation. Other features of the building include sash windows, gable roof, and timber posts and handrails on the verandah.